There is some good news floating around about the future of web browsers. As of today, web browsers rely on native code plugins to display PDF files, like Adobe’s PDF reader or Foxit reader. However, this is about to change. Fortunately for all of us, the web is quickly embracing the new technologies, and thanks to that, guys at pdf.js team plan to create a Firefox extension aka a built in PDF reader which uses HTML5 to render the documents. Going by what Mark Shuttleworth, founder of Canonical, has to say, his company “looked very closely” at replacing Firefox, the longtime default web browser in Ubuntu, with Chrome this time around. RockMelt Beta 3 Is Out! RockMelt adds over 30 features, including better Facebook chat, more Facebook integration, and a streamlined Facebook experience on RockMelt with the release of the third beta for the upcoming Chromium based social web browser. To see a condensed list of some of the new additions as well as bug fixes, simply look below. According to acceleration company Strangeloop, utilizing Google Chrome reduces webpage download times by 10% to 20% if the sites use Google’s fast Web protocol. Support for Google’s SPDY has been added to Strangeloop’s Site Optimizer appliances as well as its Web acceleration service, making download times even faster than they are with Site Optimizer alone. – Strangeloop President Joshua Bixby. As FavBrowser recently reported, there are ways to get around memory leaks in Firefox. Nevertheless, the problem appears to be serious enough for Mozilla itself to finally want to get it out of the way. It’s become increasingly clear over the last several months that we have a pretty pressing need to deal with increases in memory usage in Firefox. Since we released Firefox 4 (and before, too), we’ve seen lots of reports about Firefox memory usage being higher than in older versions, and that Firefox memory usage is growing over time. – Johnny Stenback, a developer who works for Mozilla. Going by what Mozilla has to say, the channel switcher will be removed from Firefox. Why? While the channel switcher seemed like a good idea at first, it was only really useful as a springboard it appears. This conclusion came to light due to the fact that the feature was rarely utilized once users made the switch to a particular channel. As it turns out, users of Firefox are much more interested in running different versions of the browser alongside each other, and so Mozilla has declared that its efforts are best directed elsewhere. 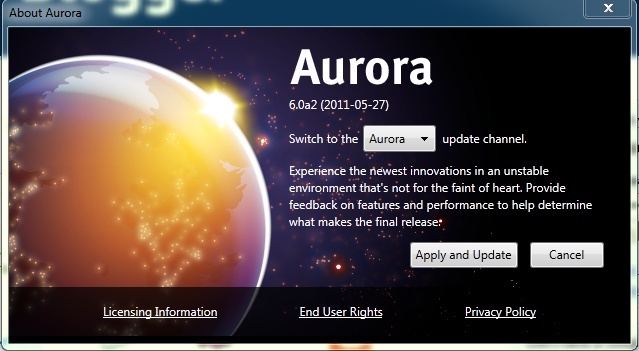 You will still be able to switch back and forth between the Aurora and Beta channels, of course. 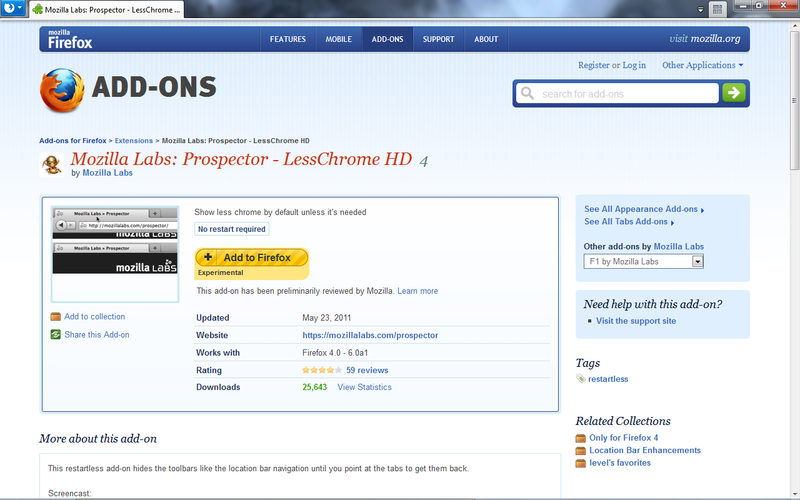 Simply visit the Future of Firefox page to obtain them. The nightly builds of Firefox have received a new tool in the form of about:permissions. Typing about:permissions into the address bar welcomes one with a dashboard that lets you configure cookies, geolocation, pop ups, password keeping, and offline storage access on a per site basis. If passwords have previously been set for a specific site, about:permissions will permit the viewing and removal of these passwords. One can also administer and get rid of cookies that sites have cached on the system or forget a site completely, eradicating it from Firefox’s memory. As of today, offline access to Gmail is no longer possible in Chrome. Gears, the software previously used in Chrome, was developed by Google and enables more powerful web applications by adding new features to a browser such as allowing some online files to be used offline. It is still available in Firefox 3.6 and Internet Explorer 8, but using outdated browsers to utilize an outdated plug in is not recommended. Offline support for Gmail is set to return via the Chrome Web Store this summer in the form of a Gmail application. More information on the matter can be found here. With Google allowing users to hide the address bar in canary builds of Chrome 13, Mozilla has decided to release the LessChrome HD extension which pretty much does the same thing. This has seemingly sparked a bit of a debate in the browser industry, as the address bar has always been an integral part of the web browser.